Leonor Ayala Polley: I understand why many in the diaspora question the slow and underwhelming response to a hurricane on American soil. Imagine if New Yorkers had been told to expect to be without regular electricity or gas for up to a year after Hurricane Sandy. Imagine if residents in Houston after Hurricane Harvey were still having to line up for hours for food rations. Imagine if your elderly mother retired to south Florida and it took a week after Hurricane Irma to get any word from her that she was alive. Imagine then that you, like me, are Puerto Rican and part of the diaspora of people on the mainland United States who watched the island brought to its knees; I couldn’t sit back and do nothing, especially with lots of relatives living there. For five days after Hurricane Maria, my family on the mainland went without any sign of life from our relatives in the town of Mayaguez, on the west side of the island; my 74-year-old mother, my aunts and my cousins went silent. (We now count ourselves as part of the lucky ones: Some families waited 10 and even 20 days after the storm.) One can understand why now, weeks after my trip, so many in the diaspora question the almost unbelievably slow and underwhelming response to this devastation on American soil. The wait to hear from relatives was excruciating, made worse by the fact that my mother had moved back there from her long-time home in New Jersey only four years ago. In those immediate hours after the storm, I had hoped that I would hear from her soon, but the news that did trickle in was not good: We heard that all of the rivers overflowed their banks in Mayaguez, and my mother’s neighborhood was especially vulnerable. One night on Zelo — an app that turns your phone into a walkie-talkie — I dared ask about her street, and a woman told me the entire area was flooded and residents were evacuated. Eventually, we realized that we couldn't sit back and just wait for a phone call, especially because the interior and western part of the island would be slow to receive any kind of aid from the port in San Juan. And so, on Sept. 24 (four days after the storm hit) I boarded one of the first post-Maria commercial airline flights to pick my mother up and bring her back to New Jersey. As our 737 approached San Juan, for the first time I wasn't greeted by the view of the shiny, bright turquoise ocean and pristine sand; the ocean was a deep, muddy brown and the coastline was battered and drenched. The captain solemnly addressed us, trying to offer all words of encouragement on our individual missions, and one flight attendant choked back tears as she welcomed us to San Juan and blessed each of us. Then I walked out into an eerily dark airport to try to find my bag and, as I struggled with my heavy suitcase walking to the car rental, my cousin Marjorie and her husband, Scott, found me: There was a 6 p.m. curfew in place, and it was almost 5 p.m. On the way to their apartment, my phone rang — a miracle to Scott and Marjorie, who had gotten no cell service since the storm — and on the other end was my Aunt Ayxia, Marjorie’s mom and the first relative from Mayaguez we’d heard from. She asked me to tell her other daughter in Denver that she was OK, and I asked Ayxia about my mom. She hadn’t seen her yet and was talking on a borrowed phone and had to hang up. My phone rang a second time 45 minutes later, and it was my mother, calling from another borrowed phone. She sounded shaky but told me that she was OK and that I shouldn’t travel to Puerto Rico to find her. I only had time to tell her that it was too late, and that I would head out west as soon as possible. It was the last time I heard from her until I got to Mayaguez, days later. At Marjorie and Scott's apartment building, they explained that they’d had no power since Irma, before Maria, so we'd have to walk up the nine floors, in a dark stairwell, to their place. We talked in the shadow of flashlights that night, snacking on nuts and other small treats we had on hand, as they explained how Maria had battered their apartment for hours. We went to bed just after 10 p.m. but, in spite of my exhaustion, it was hard to sleep amid the deafening buzz of choppers overhead and the diesel generators all around us, cranking away and spewing thick clouds of exhaust into the air. Scott and Marjorie got up at 4 a.m. the following morning to try to find a gas station with fuel — they had done so every day since Maria and hadn't been successful yet. They were desperate to know how their beach houses (which they rented to tourists) 45 minutes south in Humacao had fared, but without fueling up in San Juan there was no way to get there and back. They’d have to try for gas the next day, and if I wanted to make the journey to my mother in Mayaguez — three hours away — so would I. With no hope of getting gas that day, I tracked down a crew of co-workers from Telemundo, per prior arrangement, and we set off westward to document the aftermath but, since we also didn’t have enough fuel, we only got halfway to Mayaguez. In the town of Arecibo, we talked to business owners who were wading through thick pasty mud to haul away garbage amid oppressive heat and the odors of rotting food and dead animals. In nearby Utuado, we saw a group of people collecting drinking water in empty plastic jugs at a small natural waterfall where many others were bathing. We also saw two Army National Guard trucks carrying tanks of potable water up a steep and curvy mountain road — the only government relief outside of San Juan that I saw for days — but little other organized relief efforts, nearly a week after the storm had ended. On our way back to San Juan, we saw fuel trucks escorted by police: Gas was being rationed but, since cars were the only reliable transportation around the island at that point, gas lines stretched for miles and people waited for hours on end to purchase just $10 worth. On Tuesday morning, Marjorie, Scott and I joined the people in those lines just before 6 a.m.; around noon, we were finally able to fill up our gas tanks and head to Humacao to check on their rental properties. When we arrived at the small gated community, crews with big trucks were working to haul away debris (rumor had it that the governor was going to make a visit with a local TV crew). Their house closest to the beach was destroyed, immersed in a foot of dark, smelly water, its back ripped completely off. After a few hours trying to salvage what we could, we headed out to find some of my relatives in nearby Naguabo; neighbors told us they were in good spirits and good health, but that they had set out to find a generator. By Wednesday, I was fully immersed in the work of trying to obtain gas, food, water and a way to power up my cellphone (let alone connect with it to the outside world), while waiting for my younger brother, a paramedic in New Jersey, to arrive on the island that afternoon. I was also trying to arrange flights back to New Jersey for him, my mother and myself. On Thursday before dawn, we met up with the Telemundo crew to make the journey to Mayaguez, trying to avoid the stretches of highway rendered impassable by mudslides. It took almost twice as long to get there as normal, and when we arrived, despite the lines we had to endure just to access food, water and fuel, it took several days of cajoling to persuade my mother to even temporarily leave the island — and when we did, she swore it was just until her electricity and running water was restored. By Sunday morning, we had managed to get my mom’s essentials into two suitcases, bid my aunts farewell for now and take one final stroll through the plaza in the center of town, where a local theater troupe was preparing to perform to raise people's spirits. Nearby, there was a station set up with a cellphone so that people could call their loved ones and, all around, people were filling up water containers from fire hydrants and powering up their phones using a public power source. For a moment, I found myself thinking, “Mom would totally be OK here," but, long term, I knew that it wasn’t sustainable for someone her age living on her own, especially when the most basic and precious commodity — water — is not readily available. 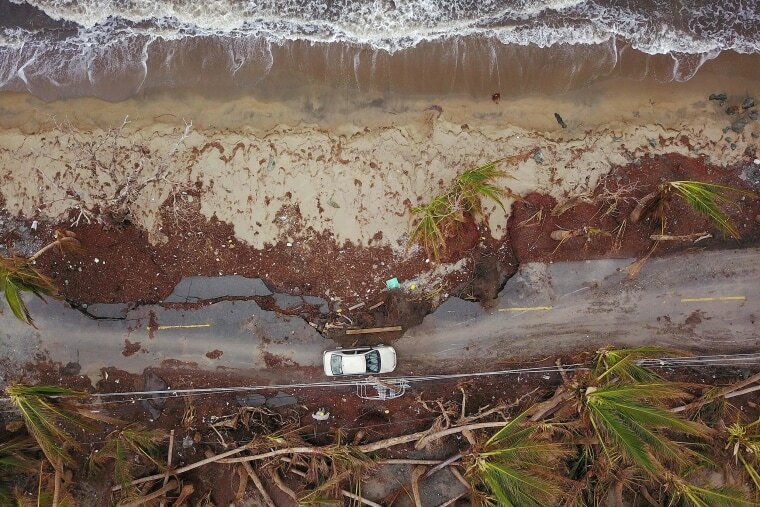 As we drove back to San Juan, the reality of the storm seemed to finally envelope my mother: She couldn’t believe the miles of scorched earth, the mountainside riddled with massive craters, the cars tossed about like toys strewn about a living room and the homes swallowed into the ground. She also saw, for the first time, the endless lines at gas stations, stores and banks. Still, she has vowed to go back as soon as she can, as did many of the elderly people around us on our flight out. And maybe she, and they, will — but, first, the federal government needs to ramp up its rescue and recovery. 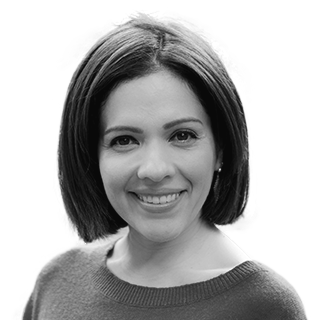 Leonor Ayala Polley is the Director of NBC News Partnerships. Leonor Ayala Polley works in New York as the Director of Diversity and Inclusion for NBC News and MSNBC. Leonor has worked as a producer and reporter for 20 years, including stints on the NBC News assignment desk, the primetime news magazine ‘Dateline,' and most recently as Northeast Bureau Chief for Telemundo network news.